A couple of days ago it was beautiful outside and we had already spent most of the morning outside playing when I came up with the idea of doing a craft. 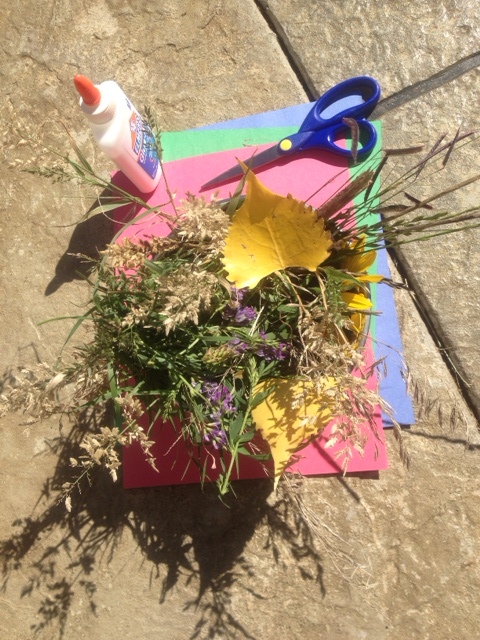 I thought it would be fun to go and have the boys pick up some grasses and leaves and such and then bring them back and we could glue them on paper. Once we found everyone’s shoes we were ready to head out. The leaves are just beginning to change here and the air was nice and warm. There is only a small section of the bike path behind our neighborhood that is open but there’s plenty of space to walk and explore for the boys. 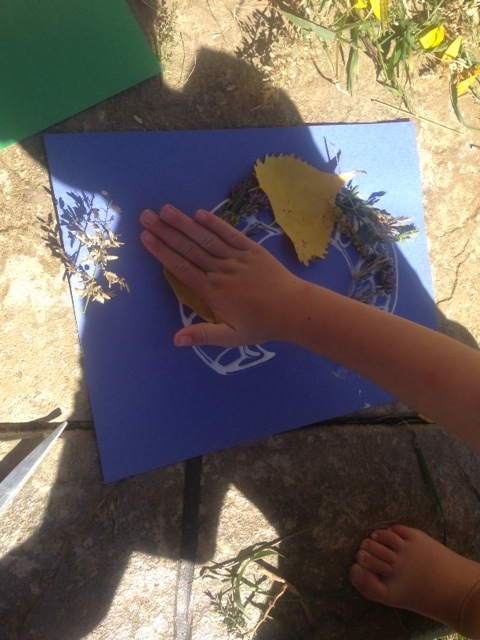 As we walked I found some leaves and grasses that I stopped and picked to show the boys what we were looking for. It didn’t take long for them to get into it and they found all sorts of grasses and leaves to pick. 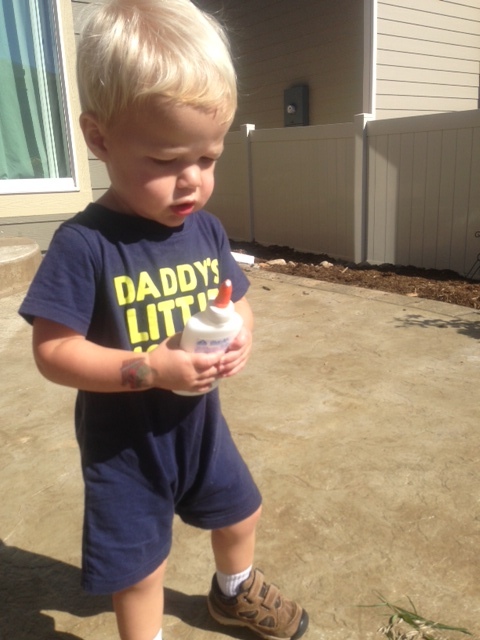 At one point I looked over and saw Caedmon bent down seriously studying something in the ground. I figured he was looking at a beetle (which has become one of his favorite things lately as explained here). And I called out and asked what he was looking at and he stood up with the biggest grin on his face and held up his hand to show me his prize. It was a handful of dog poop. Needless to say that didn’t make it into our collection of goodies! Leighton insisted on picking some sunflowers for our collection and we had a great walk and took in all the colors of the changing leaves. 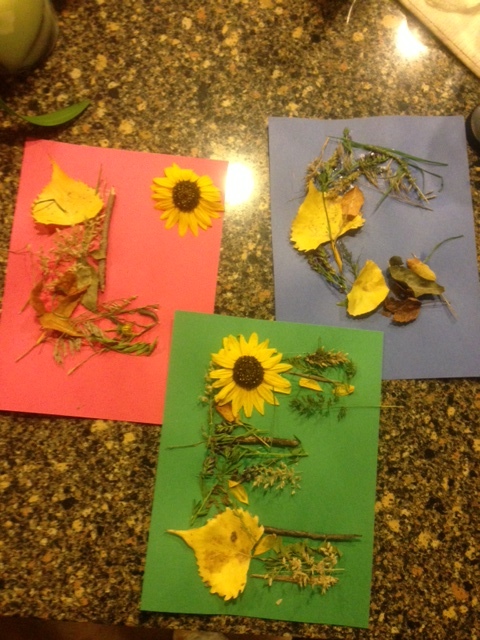 When we got back we decided to make their initials out of the nature findings. Caedmon was insistent on being the one to use the glue. Luckily the glue had a lid that closed so we didn’t end up with glue over everything. I was sneaky enough to steal the glue away from him to use it when and where we needed. Leighton was great at picking out the grasses and such to lay on the pages. In the end we had beautiful letters, a L for Leighton, a C for Caedmon, and an E for Edric, who we are waiting to bring home from Korea. That night as I was tucking Leighton into bed, he told me that when I go to pick up Edric from Korea that I will have to take Edric’s picture with me and show him. I have a feeling when we finally get to the point in this process of actually going to pick him up, the craft project not be travel-ready, but at least he’s thinking and trying to understand that he has a brother on the other side of the world waiting to come home.